I use Dreamfield’s penne pasta in this- low glycemic and it really does taste like regular penne. You can use jarred roasted peppers in this, but I roasted my own out on the grill the day before when I barbecued. Cher them until black, then toss them in a bowl and cover the bowl; let them cool off. The charred skin slips right off. Don’t rinse them. Any little blackened bits that hang around are ok. You can slit them and cut out the seed ball and toss the stem as well. If using within a few days, drizzle them with olive oil and refrigerate, although roasted peppers freeze well in ziplock freezer bags. You could also make this pasta with salsiccia or meatballs if you want. Shrimp would be good too. Puree roasted red peppers, roasted garlic, and heavy cream in a food processor. Heat oil in a large skillet; add onions and chicken, salt, pepper, red pepper flakes, and cook until chicken is about halfway done. Then add white balsamic vinegar and mushrooms, cooking further until mushrooms and chicken are done. Stir in artichokes, basil leaves and red pepper sauce, heating until hot and basil is wilted. 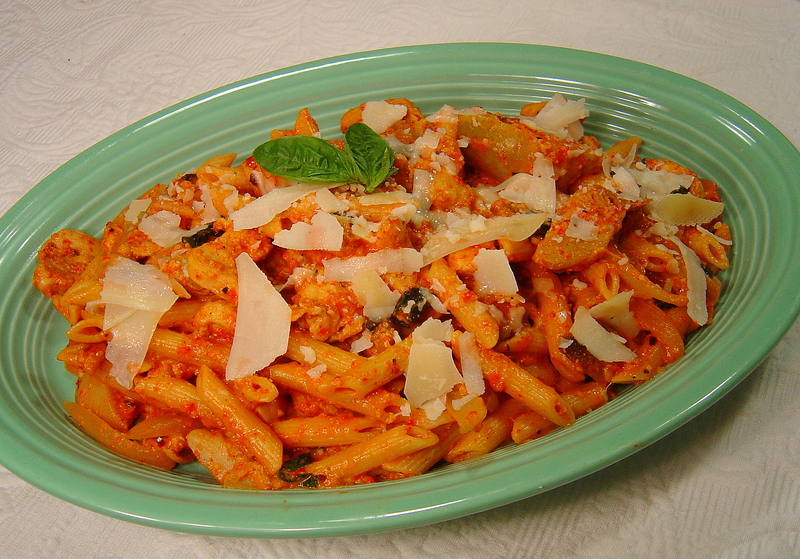 Toss mixture with cooked penne pasta and sprinkle with Parmesan cheese. G’day and YUM Sue! I wish I could come through the screen and try some of this right now too! Your pasta dish sounds terrific with the roasted peppers.